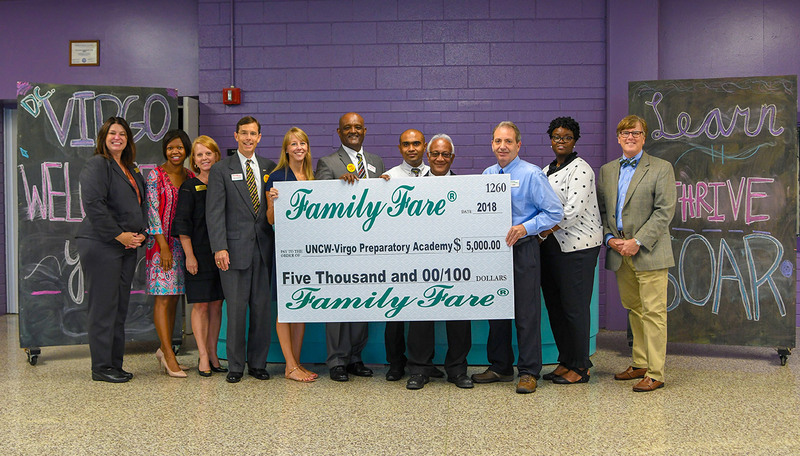 UNCW has received a $5,000 donation from Family Fare Convenience Stores to aid in the startup of D.C. Virgo Preparatory Academy. Family Fare President Lee Barnes, Christy Barnes ’95 and local franchise owners visited Virgo to present the check to Watson College Dean Van Dempsey and D.C. Virgo Principal Sabrina Hill-Black on July 23. The gift, part of Family Fare’s Shared Purpose Initiative, will provide resources for teachers. 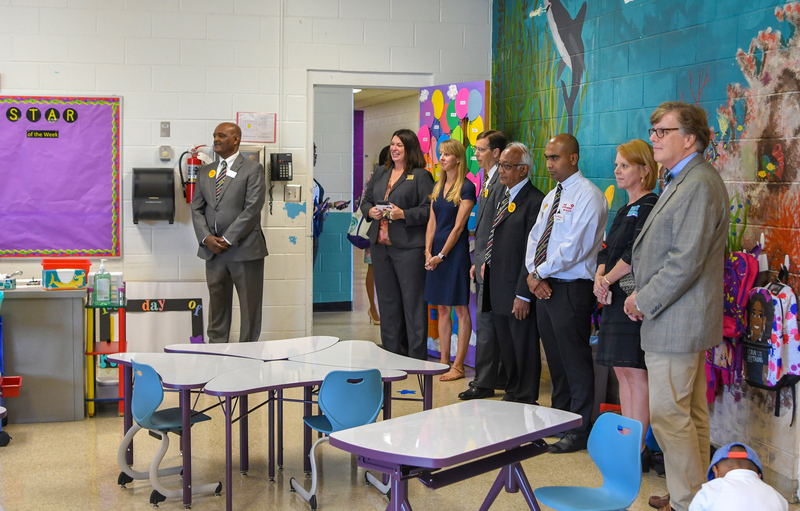 D.C. Virgo became a K-8 year-round school in July through an initiative led by UNCW in partnership with New Hanover County Schools and the D.C. Virgo community. The school is the result of a legislative initiative aimed at providing enhanced opportunities for students and model sites for teacher and principal preparation. Lee and Christy Barnes were intrigued when they read about the new D.C. Virgo in UNCW Magazine. Christy Barnes is a former kindergarten teacher who earned her degree in Elementary Education from the Watson College, and the Family Fare team was pleased to hear that funds would be used to support teachers, Dr. Barnes said. Family Fare franchisees in the greater Wilmington area authorized the $5,000 donation. Contributors are Ash Tilahun, 3rd Street Family Fare; Govinda Chhetri, Wildcat Family Fare on Market Street near New Hanover High School; and John Phillips, Shallotte Family Fare. Family Fare Business Consultant Shashi Patel also supported the initiative and attended the July 23 event. Following the official check presentation, UNCW Lab School Implementation Coordinator Jessica Swencki led the group on a tour of D.C. Virgo. Dempsey, Hill-Black, WCE Associate Dean Donyell Roseboro and WCE Development Director Dawn Carter participated in the tour with members of the Family Fare team. The group discussed community engagement plans and volunteer needs that include reading to kindergartners, mentoring students and providing opportunities to help middle schoolers explore future career options.